In May 2017, The Australian Law Journal celebrates its 90th anniversary. In considering how best to celebrate this milestone in Australian legal publishing, the Editorial Committee came to the view that retrospection was best left to the centenary. Ninety years is undoubtedly an important milestone, but it looks forward to one hundred. It therefore seemed appropriate to mark the anniversary by identifying uniquely Australian subjects of present national importance and which were likely to be such over the next decade. Two topics presented themselves: the relationship between the Aboriginal and Torres Strait Islander people and the law, and the future of legal education in Australia. The first topic became the subject of the special May 2017 issue of the Journal which marks exactly the 90th anniversary. 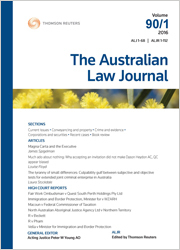 A series of special articles was commissioned under the guest editorship of Professor Megan Davis, one of Australia’s foremost Indigenous legal academics. Talking about the future of legal education in Australia demanded a different approach. 2017 is the 30th anniversary of the Pearce Report, the last national, systematic review of legal education. Obviously enough, the legal landscape has changed considerably since then. In the intervening 30 years, and with some limited exceptions, the various legal constituencies have tended to talk among themselves about legal education – academics to academics, practitioners to practitioners, judges to judges. There have been very few opportunities to bring all those groups together. One “peak body” which comprises members of all those constituencies is the Australian Academy of Law, which is 10 years old in 2017. The AAL and its anniversary was a very happy coincidence with the ALJ’s celebration. When I suggested to the AAL’s President, the Hon Kevin Lindgren QC, that the ALJ and the AAL should combine to present a conference on legal education, he and his committee embraced the idea enthusiastically. The organisers hope that the conference – like the ALJ itself – will provide a national opportunity for the entire legal profession to come together and talk about this very important topic. The future of the law in Australia depends upon what and how tomorrow’s lawyers are taught and trained. To give an international perspective on the big question of what kind of legal education should be offered, we are delighted that the legendary philosopher Professor Martha Nussbaum of the University of Chicago Law School has agreed to come to Australia to give the opening address. The conference will then feature papers presented by Australian experts on numerous aspects of the topic. Quite apart from the formal conference sessions, the organisers hope that the conference will be the venue for vigorous and enjoyable discussions among people who might not usually get the chance to meet each other. The organisers hope that the insights from the conference will have a real impact on the education of the next generation of Australia’s lawyers. Some of the key papers will appear in the ALJ and consideration is being given to how the entire proceedings can be published. The AAL intends to produce a discussion paper based on the papers and commentaries at the conference. I warmly encourage everyone who is interested in the future of the law in Australia – student, practitioner, judge or academic – to register for this very special event. For program and registration details, click here.